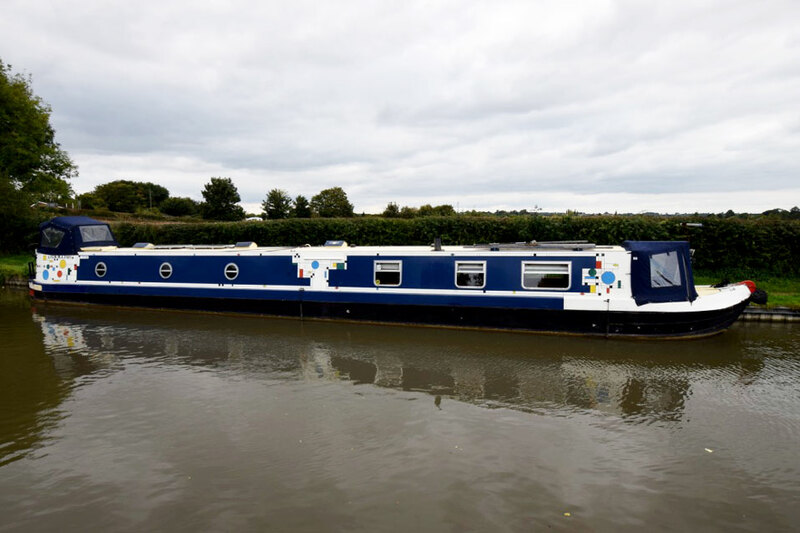 Ayer Rajah, meaning ‘Water King’, is a 64’ Semi Traditional 2004 narrowboat built by the well known and well regarded Keith Wood. Her colours and stained glass are based on designs by Frank Lloyd Wright. She has been lived on for several years by the current owners and so is fully equipped for immediate and comfortable occupation. 64’ offers plenty of living space fitted out in ash faced ply with oak trim. From the well deck, with a good condition cratch cover, into the nearly 17’ saloon. This is open plan, and houses a two seater sofa, a 3 section cross boat table which stores neatly under the gunwales, the Morso solid fuel stove, and the TV / DVD station. The washing machine is accessed from in here. The galley, with a huge stained glass side hatch, is horse-shoe shaped with plenty of storage, full hob, oven & grill facilities and a 12v fridge with icebox. A midships cabin follows. This has a large and comfortable sofa in it, as well as a wardrobe and large cupboard. The sofa makes into a double berth, and this room offers many options including an office, a studio, a bunk bed room, a nursery or leave it just as it is…a beautiful second sitting room and spare double bedroom. The bathroom is next, with a Thetford cassette loo, a ceramic sink, mirrors a-plenty & a curtained shower over the bath. The fixed double berth bedroom is at the stern. The bedboard is 6’3” x4’, but there is a width extension to the bed and the fold over mattress once open is 6’3” x 4’ 10”. Lots of storage in here both under the bed, in the large wradrobe, and in cupboards over the bed. Ayer Rajah is equipped with solar panels, a 300w inverter, and an engineroom-housed 4kw generator (diesel fed off the main tank). The radiators and towel rail on board are heated via a back boiler from the solid fuel stove, and hot water is supplied by either the back boiler, the engine-heated calorifier or an immersion heater. The stern deck has a good condition pram hood and is over the ever popular Beta 43 engine.